Nixon said his budget would invest a total of $131 million in additional state and federal funding for the Development of Mental Health-Division of Developmental Disabilities. Of the proposed budget, Nixon said $5 million would fund an expansion of the University of Missouri-owned Thompson Center. Per a media release, the expansion would allow an additional 2,000 visits each year by expanding research space and by training 100 more providers over the next five years. Lora Hinkel’s 13-year-old son Blake was diagnosed with autism before his second birthday. Lora said she believes Blake would be non-verbal if not for the support of the Thompson Center. Governor Nixon said his proposed budget will also include $1 million to create an autism clinic at Truman State University, and $500,000 to expand services at the Mercy Kids Autism Center in both St. Louis and St. Charles. 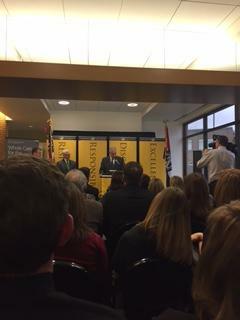 “The demand for services and training for services far outpaces the supply and partnering with these outstanding higher-education institutions, with the leadership of the University of Missouri, we can provide the human-capital resources necessary to meet the human needs of the future,” Nixon said. Hinkel said the funding and support of the center has provided Blake with a central location to receive all necessary services and treatments. Nixon will present a full budget proposal before his State of the State speech on Wednesday.